Even when I am in a bad mood, the future thought of getting out of the bad mood and feeling happy again... makes me happy! 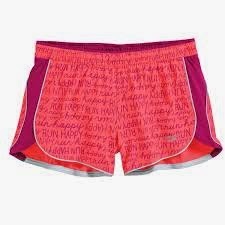 And when I saw these running shorts from Brooks, I had to write a post about them, because they have "Run Happy" written all over them. Literally. They do! I love Brooks' Run Happy slogan- it's brilliant, upbeat and so true. Cause we all want to run happy, right? Please share - what top five things make YOU happy?